I have begun working on my new waterlily painting, finally! The link to one of the source photos is here. I took this picture at the Denver Botanic Gardens. I have added 3 waterlilies and a bud to the scene and adjusted the layout so that it is a better composition. I carefully drew the scene at about 8"x11" size and then enlarged it to 21x29 (basically a full sheet of watercolor paper). I am using Arches cold press, 140 lb. paper. 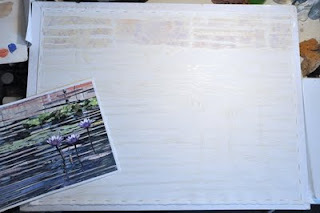 I stretched my paper onto a gator board and applied masking to the waterlilies, waterlily pads, and some of the reflections in the water. The masking will protect these areas from paint, so that I can remove it later and paint in those areas or leave them white. 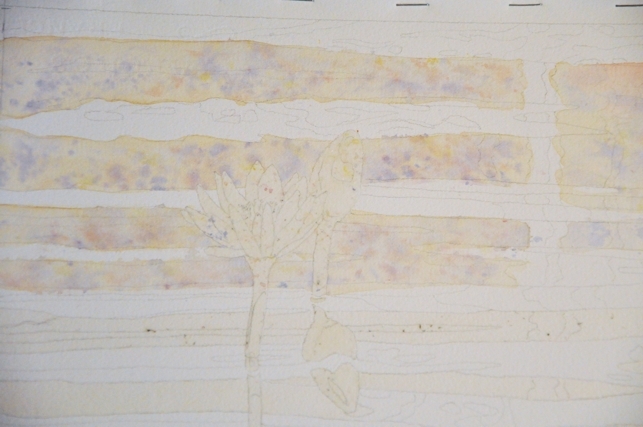 As you can see from these images I have started at the top of the paper and the background water in the scene. There is a very unusual creamy, peach reflection in the water with some gray texture over that. I used quinacridone gold and a touch of permanent rose and cobalt blue for the cream color. 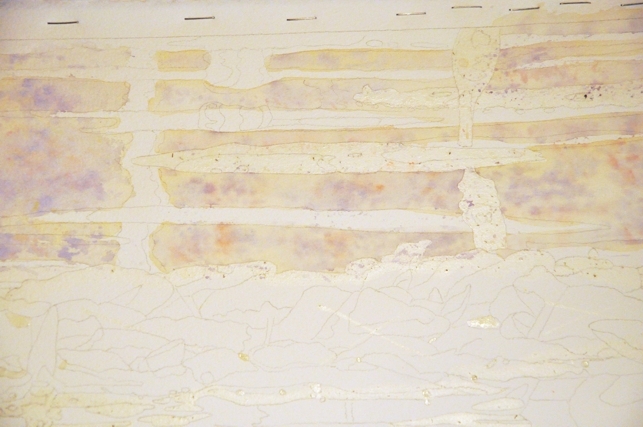 I wet the paper in sections and applied the cream color on the wet area. Then while this was still wet, I used a damp sea sponge to apply a purply/gray mixture over the cream for the texture. As I work on this painting, I will be posting updates to the progress and I may post a video, too, so please check back. I look forward to following you on this painting. Video would be cool too. Thanks for sharing your process.